Zinedine Zidane has admitted that “there are many players here that can be sold” amid speculation that Real Madrid are planning a massive summer clear out. 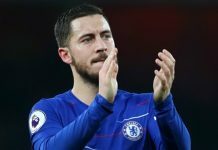 Madrid have already brought in Eder Militao from Porto for £42m and they have been linked with an array of other big names, including the likes of Eden Hazard and Paul Pogba. As part of the overhaul, Zidane is expected to cut loose a handful of players to help freshen up the squad for the 2019-20 season. Asked specifically about the future of Isco, one of those tipped to move on in the summer, Zidane told reporters: “There are many players here that can be sold because they are all really good. Los Blancos travel to Leganes on Monday night, aiming to close the gap on second-placed Atletico Madrid to two points.